Here we are again: the Lake Wobegon effect. 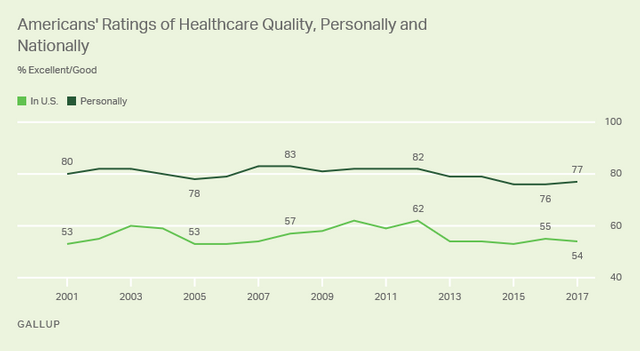 A recent Gallup poll shows just that, as 77% of American adults believe our personal healthcare quality is good or better, yet only 54% say the same about national healthcare quality. Why? Perhaps the sample comes from a socio-economic group that gets great quality, yet laments what it sees in the system as a whole. Unfortunately, no, that doesn't seem to be the case. Gallup nicely describes its methodology right beneath the results. Click the link beneath to see the whole story. Do you agree this is illusory superiority or no? Story Highlights 77% rate the quality of their own healthcare as "excellent" or "good" Ratings of personal coverage and cost have edged up since 2016 Worst rating for national healthcare coverage since 2008 WASHINGTON, D.C. -- After multiple unsuccessful attempts by Republicans to dismantle the Affordable Care Act this year, Americans continue to be more positive about their own healthcare than the nation's healthcare as a whole when evaluating each on quality, coverage and cost.